There are several species of billbugs that occur on turf in New England, but the bluegrass billbug (Sphenophorus parvulus) is probably the most common species on lawns. As its name suggests, its primary host is Kentucky bluegrass, but it also attacks perennial ryegrass and fescues. Occurrence of the bluegrass billbug in New England is generally very sporadic, but when it does occur, it can cause severe damage. Adult billbugs are grayish or black weevils. The body is not quite 1/4-inch long, with a relatively broad thorax ("shoulder") which extends about 1/3 of the total length. A fairly long, narrow snout extrudes from the head. Larvae are white or cream colored with brown hardened head capsules. They have no legs but can move through the soil and thatch by pushing and pulling like worms. They range in size from 1/16-inch to 1/4-inch as they mature. The bluegrass billbug completes one generation per year. Billbugs overwinter as adults in semi-protected areas (in surface litter around buildings, in leaf litter, or in hedgerows). Adults emerge during the first warm periods in the spring and begin to move to suitable turf sites. Adults can be observed crossing paved areas on sunny days in late May or early June. In June the adult females lay eggs which hatch into small larvae. The larvae feed within the grass stems for about two weeks. As they grow, they molt and move to the bases of plants, where they feed on the crowns. Eventually they also feed on roots and rhizomes. In areas where bluegrass billbug larvae have been feeding actively, the turf will pull up easily, and break at the crown without disturbing the roots. There will be accumulations of fine, white almost sawdusty "frass" (insect excrement). This sawdusty material serves as positive identification of bluegrass billbug damage. Feeding damage usually is evident along the edges of paved areas and may resemble salt damage except that billbug damage appears in July. Eventually the damage may spread throughout the turfgrass expanse. Larvae continue to feed for most of the summer and then pass through a brief pupa ("resting") stage in the soil in late August. Young adults then emerge and seek out suitable overwintering sites during September and October. Thus the primary period for damage is in late July and most of August, while the larvae are feeding actively. Bluegrass billbug adult activity is surveyed most easily by observing paved areas near bluegrass or primarily bluegrass lawns on sunny days in late May or early June. When two or more adults are observed per minute, damage along the adjacent turf area can be expected. Thus, if you observe the pavement for five minutes and see 12 billbugs, you can expect to see billbug damage about six weeks later. Pitfall traps may also be used for monitoring purposes. The estimate for tolerance levels (thresholds) for larvae varies widely, but a reasonable starting point for moderately maintained turfgrass in New England appears to be 8 to 12 larvae per square foot. Several cultivars of lawn-type turfgrasses have demonstrated resistance to bluegrass billbug feeding. This resistance is often associated with the presence of an endophytic fungus, which grows inside the plant and makes it unpalatable to a variety of surface-feeding insects. Endophytes have not yet been discovered in any Kentucky bluegrass varieties but are available in several perennial ryegrass and fescue cultivars. Some Kentucky bluegrass varieties are naturally resistant to bluegrass billbugs, however. 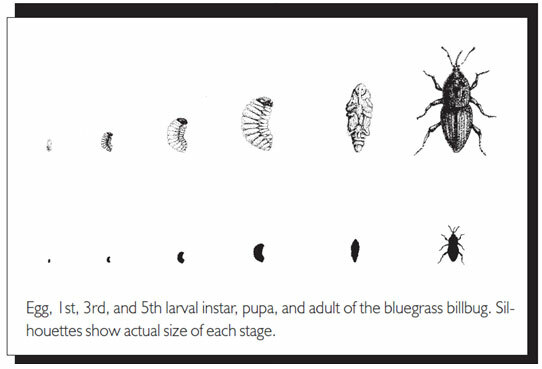 Unfortunately most bluegrass billbug problems become apparent in late July or early August as the larval population increases in size and feeds more voraciously. Once the population reaches the largest larval stage, it is too late to obtain acceptable levels of control. Studies in Pennsylvania and Ohio have shown that timing of applications is particularly difficult because there are at least four species of billbugs that may be present and the timing for each is a little different. Some turf managers like to target adults (in late April or May), but the period of time when those adults are present and vulnerable appears to be seven to ten days, so there is plenty of opportunity for improper timing. So, the most reliable timing of application for New England appears to be June, targeting small larvae. Several traditional insecticides have shown reasonable activity against billbugs. In addition to endophytic ryegrass and fescues, turf managers can consider using entomopathogenic nematodes on billbugs. Field trials in the Northeast have been very limited so far, but trials in Alabama and Ohio have looked somewhat more promising. Entomopathogenic nematodes cause disease in the target insects. The nematodes are packaged such that they can be sprayed through a standard hydraulic sprayer. The species which has demonstrated the most potential (Steinernema carpocapsae) is very sensitive to desiccation, so it should not be applied in drying conditions (midday in midsummer, low humidity, and breezes) and should be irrigated immediately after application. Applications probably should be timed to coincide with emergence of small larvae, usually late June or early July.